How Do You Know If You Have a Salmonella Infection? You are here: Home / News / How Do You Know If You Have a Salmonella Infection? Food poisoning has very specific symptoms, depending on the pathogen that made you sick. One of the ways to empower yourself and protect yourself against these serious illnesses is to recognize the symptoms. Salmonella infections have very specific symptoms. But these symptoms can also be caused by other pathogens and illnesses. Gastritis, which is inflammation of the stomach lining, can cause vomiting. An ulcer can also cause vomiting. A norovirus infection can make you sick too, as can gallstones, and some food allergies. Unfortunately, many people who have been infected by Salmonella bacteria may pass the infection off as the “stomach flu.” But there really isn’t any such thing as the stomach flu; those people most likely had food poisoning. The flu, which is caused by a virus or bacteria, causes symptoms of headache, fever, stuffy nose, body aches, and sore throat. Salmonella bacteria can contaminate many foods. Salmonella outbreaks in the U.S. have been linked to ground beef, precut melons, eggs, raw chicken, pasta salads, and even dry breakfast cereal. In 2018, Salmonella infections sickened at least 1,394 people and led to dozens of hospitalizations. And those are just the cases reported to the government. Most people do not see a doctor when they get sick with Salmonella food poisoning. Public health officials estimate that Salmonella causes 1.2 million illnesses, 23,000 hospitalizations, and 450 deaths in this country every year. When ingested, the bacteria attaches to the cells that line your intestines. 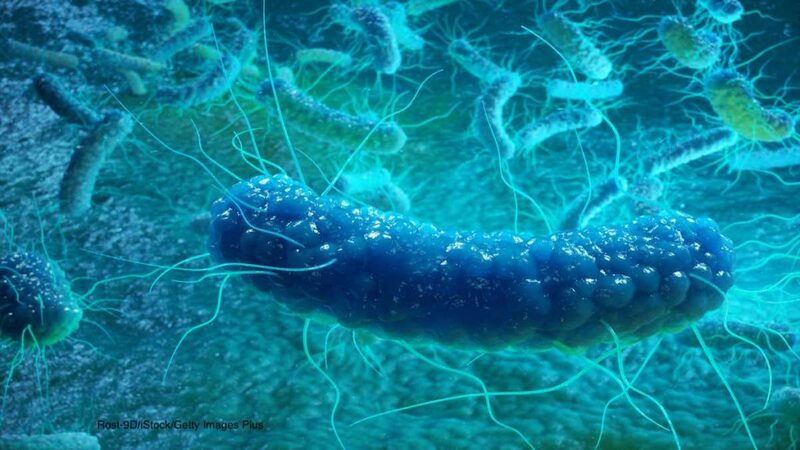 The Salmonella bacteria start to attack those cells, and produce toxins that can travel throughout the body. So what are the symptoms of a Salmonella infection? Note that most patients will have most of these symptoms. Fever. Most Salmonella infections cause some type of relatively mild fever. Headache. The headache could be caused by dehydration, which can occur when a patient can’t keep liquids down and has diarrhea. Abdominal cramps. These cramps can be very painful, and usually precede a bout of diarrhea. Nausea. The feeling of wanting to vomit or feeling repulsed by food. Vomiting. Most Salmonella illnesses cause vomiting. Diarrhea that may be bloody. This symptom is one of the most alarming. It’s an indication that the intestinal wall has been damaged by the bacteria. And unfortunately, there can be long term consequences of this infection that may appear years after the illness is over. Some people develop Reiter’s Syndrome, which can lead to reactive arthritis and eye irritation. Others can develop high blood pressure, endocarditis, and irritable bowel syndrome. Knowing the symptoms of Salmonella food poisoning is important, especially for the parents of young children, the elderly, and anyone with a chronic illness. Those patients can get sick enough that they need to be hospitalized and may die.